An interdenominational Christian non-profit organization bringing hope to the hurting in Lewisburg and all of Marshall County, TN. HOPEtown is a Christian non-profit organization devoted to ministering with those in need in Lewisburg, Tennessee and the surrounding area. We are not a church, nor are we the ministry of any particular church. This is by design. Quite deliberately, we are both non-denominational and interdenominational as part of our effort to transcend and even dismantle barriers so that we can serve and partner with the entire community. Close partnerships include the Marshall County unit of the Salvation Army; several different churches, businesses, and civic organizations; and numerous individuals in the community. Through a variety of continuously expanding programs, we minister with those in need of food, clothing, hygiene items, rent & utility assistance, home maintenance & repair, counseling, worship, Bible teaching, spiritual mentoring, and assistance with homelessness. 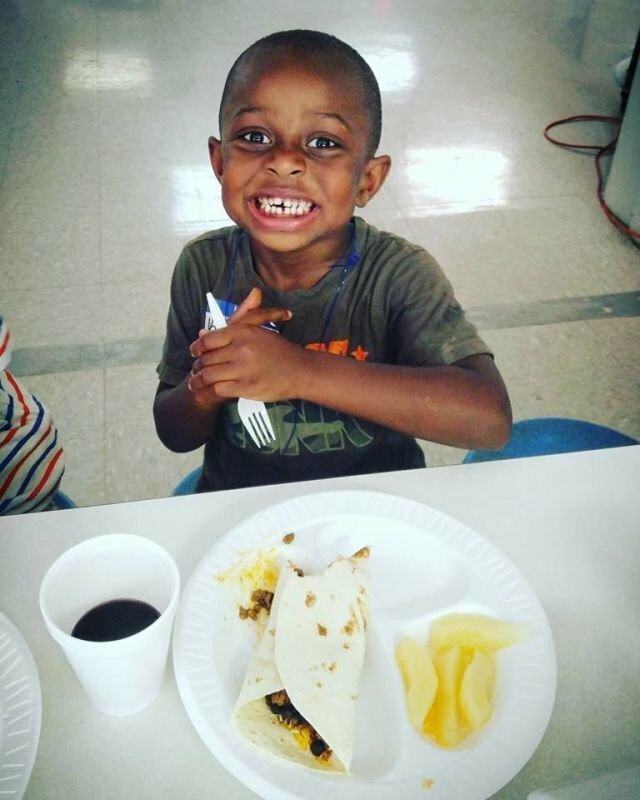 Additionally, we provide summer nutrition and enrichment for children, and we also are grateful to provide safe shelter and aid for domestic violence victims. Meeting unmet needs is always what we aim to do, and we pray that God will enable and equip us to add additional programs as the need demands. DOING GOOD IS NEVER BAD, AND DOING RIGHT IS NEVER WRONG. This is the fundamental philosophy behind everything we do . We believe this is the natural conclusion drawn from what Jesus both taught and lived. He taught us to do for others what we would want done for us...to give, without expectation of repayment, to those with no ability to repay. And instead of keeping His distance and merely ministering TO the poor and sick and sinful and forgotten---those living on the margins of society---He chose to minister FROM the margins, having Himself grown up in a poor family in a backwater town (Nazareth) in a rural region (Galilee) that also was the site of most of His own ministry. This prophetic approach to ministry, foretold by the Hebrew prophet Isaiah 750 years earlier, didn't exactly make Jesus popular with the religious leaders of His day, but He wasn't focused on popularity or prestige. He didn't need to justify His work by receiving the stamp of approval from the establishment. He simply did what was good and right, and never once was it---or was He--bad or wrong. He was the living Word of God, and He still is and forever will be. It is our aim at HOPEtown to honor Jesus by walking in His steps. We deliberately occupy the margins because we believe it is from the margins that we are best situated to (1) minister to the marginalized, (2) sound God's prophetic call to the religious establishment, and (3) remain humble enough to confess our own needs so that we may be ministered to as well. 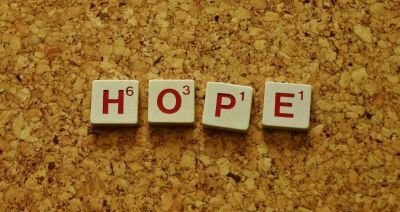 HOPEtown is not so much a ministry TO people in need as it is a ministry WITH people in need, for we all are needy as we stand before the God who, glory to His name, is able to fully meet our needs in the saving grace of His Son. May all we do always be in His name and to His glory. 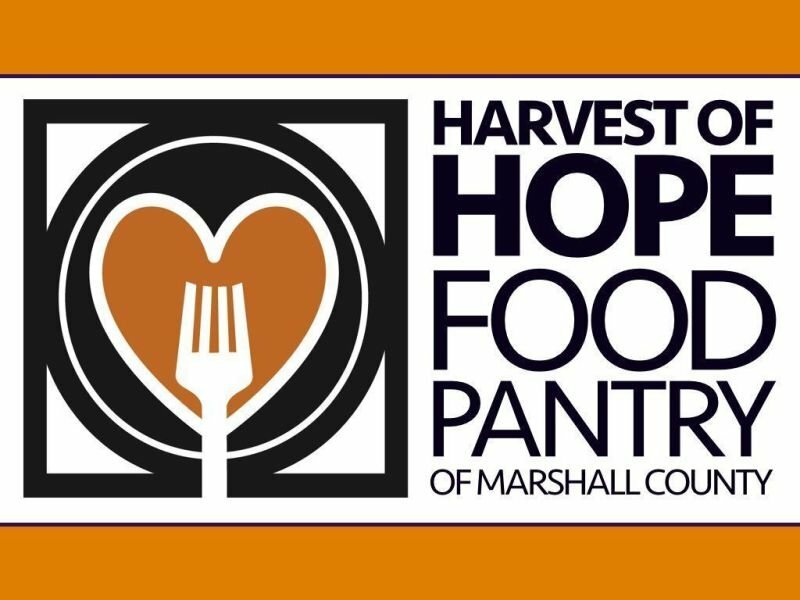 Harvest of Hope Food Pantry of Marshall County is our constantly maintained supply of non-perishable food items that we use to regularly assist those in need. These food items are almost entirely provided by local individuals, churches, businesses, schools, and civic organizations. Martha's Closet is our clothing ministry. 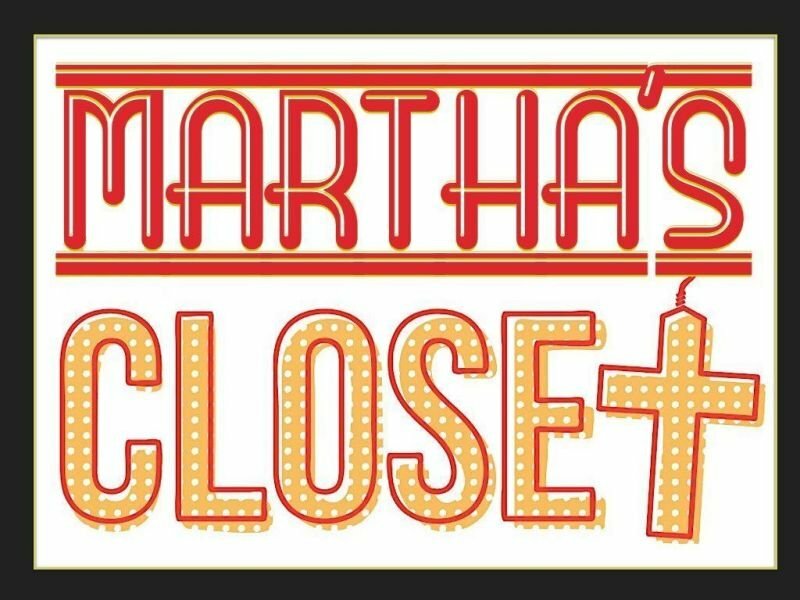 We receive innumerable clothing donations and then organize them and place them in our Martha's Closet store, in which those in need may shop at no charge for whatever clothing needs they and their family may have. New Beginnings Domestic Violence Center is a ministry, at the center of which is a local shelter we oversee, that aids victims of domestic violence. Victims and their children may stay at our shelter cost-free for up to six months as they recover and take their first steps toward freedom and new opportunity. Meet In The Middle is the name we've given to our FREE weekly lunch every Wednesday from 11 am-1 pm. Everyone is invited and encouraged to attend this meal, which is less about food and more about the opportunity for people from all sectors of our community---business leaders and bricklayers and machinists and nurses and stay-at-home parents and homeless people---to get to know each other while they're eating. The cost of this program is partly covered through our partnership with the Salvation Army. Jericho Road, which owes its name to a detail in Jesus’ timeless parable of the Good Samaritan, is the program in which we provide rent/utility/homelessness assistance for local residents in need. Hands of Hope is a grassroots, volunteer-led program focused on providing cost-free home maintenance and repair for elderly or disabled persons who do not possess the financial means and physical ability to perform the needed work themselves. Church On The Street is our weekly worship event on Saturday evenings. At 4 pm we have an open gym time for kids (we provide adult supervision). At 5 pm we have an interdenominational worship service led by our Executive Director and by a rotating cast volunteers from several different churches. During this service we also offer children's classes taught by dedicated and skilled volunteer teachers. At 6 pm we serve a hot and delicious meal to every person present (worship attendance is not required), the cost of which is covered through our partnership with the Salvation Army. Bright Ideas is our summer children's program. From 8 am-noon on summer Tuesdays, Wednesdays, and Thursdays, we provide food in addition to educational, spiritual, and character enrichment for K-6th grade children. As in all our programs, there is no cost to the children or their families. An after-school component of this program will be beginning on Thursday, March 7. Frank grew up in Lewisburg and returned home to found HOPEtown in February 2017 after 25 years of church ministry in Michigan, Montana, Virginia, and Maryland, in addition to extensive mission work in China and Vietnam. Frank and his wife Julie, also a Lewisburg native, have five children and two grandchildren between them and are having the time of their lives ministering at home with the beautiful people of HOPEtown. The historic Connelly School, which has served as a high school, junior high school, and middle school, dates back to 1929. 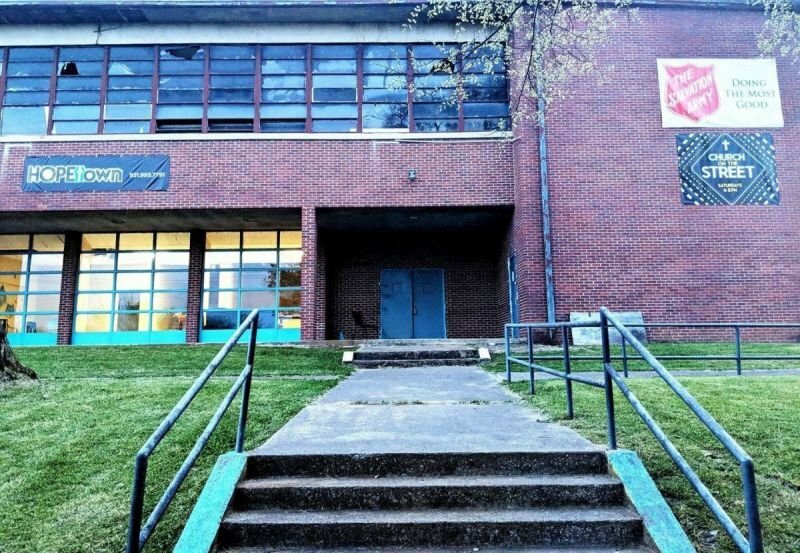 It ceased its school functions more than twenty years ago, and its cafeteria, kitchen, locker rooms, mezzanine, gymnasium, and athletic field now serve as the hub of our work in Lewisburg. Sitting near the center of the largest and most impoverished neighborhood in the city, its location and history make it an ideal site from which to reach out to those in need in our community. We realize that it's not the prettiest or most state-of-the-art spot in town, but it serves God's purpose in our ministry and serves it well. We also realize that some would say the building's best days are behind it, but we don't see it that way at all. As we see it, our facility's marginal condition and reimagined purpose enable it to serve as an ideal metaphor for the work God is doing in us and with us at HOPEtown. We believe that means its best days are now and that even better days are yet to come! Closed on Sundays. Open on Mondays by appointment only. Tuesday-Thursday 9 am-5 pm. Friday 9 am-2 pm. Saturday 12-7 pm. Please call us at any time if your need is a dire emergency.